As Head Coach of the Club she founded in 1975, Dasa brings a wealth of knowledge and experience to the club. 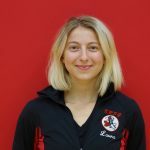 A former national stream RG gymnast in her native Czechoslovakia and a graduate of the University of Ottawa in the Physical Education Honors program. Dasa is a NCCP level 3 certified coach and a fitness instructor. Dasa is passionate about coaching and is dedicate to providing a fair and healthy environment, where all athletes can reach their gymnastic potential. Dasa coaches and oversees all levels of RG within the club, shaping the club’s philosophy of teaching physical skills, sportsmanship and everyday conduct supported by strong moral values. Dasa is a long-time resident of Kanata who raised 3 boys in the Kanata community, and has happily welcome 6 grandchildren into the family. Dasa was awarded with the Ontario Coaching Association’s Coach of the Year Award in 2010. In 2015 Dasa Lelli received The Brian Kilrea Award for Excellence In Coaching. Yuliana joined the KRSG staff in the summer of 2015 and is in charge of the development of National stream gymnasts in a club. Yuliana’s past experiences provided her with a strong/solid base in the RG elite area where she was given the opportunity to work along the best in the highly competitive environment. Now, Yuliana is excited to bring and share her knowledge with the coaches and the gymnasts in the KRSG club. Yuliana is NCCP Level 3 Certified Coach and an International Brevet level Judge. 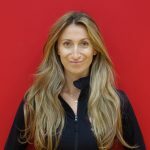 She graduated from the Competitive Coaching Program at Seneca College and from the Kinesiology Program at York University. In addition, Yuliana is an athletic life coach and offers an extensive expertise in developing young individuals with a healthy mind and body. This, along with a focus on physical health and athleticism has aided her to effectively impact the athletes and help them grow in all areas of their life. Sharon has her NCCP level 2 coaching certification. Sharon is a former provincial individual gymnast and 3 time provincial champion training with KRSG in the 1990′s. 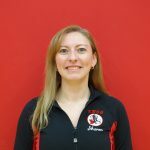 She has attended 4 Canadian Gymnaestradas and 3 World Gymnaestradas in Austria, Switzerland and Finland and is the current KRSG team manager for the 2018 Canadian and 2019 World Gymnaestradas. Outside of the gym Sharon is the Manager of Events for the Canadian Wind Energy Association. Breanna has her NCCP level 3 coaching certification and is also a certified interclub and provincial level judge. Breanna joined the club in 2000 and is a former 5 time provincial champion and national level competitor with KRSG. Breanna has also participated in 2 Canadian and World Gymnaeastradas. Breanna attended École Nationale de Cirque in Montreal for her post secondary education specializing in aerial acrobatics and contortion. 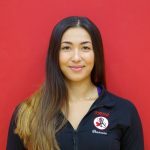 After school, she moved back to Ottawa to continue coaching at KRSG sharing her knowledge with her athletes. Breanna says "there is so much that kids can learn in the gym that can be taken with them throughout their lives." That being said, she loves working with kids and helping them grow not only as gymnasts but as children and young adults. Irina has her NCCP level 1 theory and technical certification. She joined KRSG in 1998 for one year and returned in the summer of 2008. Irina is originally from Russia where she graduated from Arts University with a Bachelors degree in Choreography. She has spent years performing professionally in dance groups. From 2000 until 2008 Irina shared her time between leading the kids fitness programs at Planet Fitness in Russia while at the same time she continued increasing her experience as a choreographer. Irina also worked in Italy as a ballet teacher before moving to Canada. Irina says, "Dance is not what you do, it is what you are!" Laura has her NCCP level 2 coaching certification. She joined KRSG in 2002 with the recreational program. At the age of 9 Laura joined an Interclub AGG, Kanta Energy. Later on she competed in an interclub duo, a provincial trio and as a provincial individual. 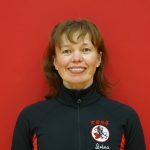 She has attended the Canadian Gymnaestradas in Winnipeg and Calgary, as well as the World Gymnaestradas in Switzerland and Finland. Marie is a level 1 NCCP certified coach and joined KRSG at the age of 6 in the Butterflies program. The following year she was invited to audition for the Provincial program where she competed individually for 10 years. Marie competed in the 2010 Ontario Winter Games, and has participated in one Canadian Gymnaestrada and one World Gymnaestrada in Helsinki. She is currently taking her Honours BSc in Human Kinetics at the University of Ottawa and is working towards becoming a physiotherapist. Adeline has her NCCP level 1 certification and she is working towards getting her level 2. She has been involved in the KRSG club since 2008, starting at the Interclub level and later moving into the provincial stream. This year, she is part of a rhythmic group of 5 gymnasts working with hoops and clubs. She has participated in one Canadian Gymnaestrada and one World Gymnaestrada in Helsinki, Finland. Adeline is currently in high school. She hopes to share her gymnastics experience with your young gymnasts. Brianna is an NCCP level 1 certified coach, and she has also completed her NCCP level 2 technical and theory courses. 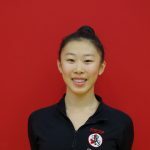 Brianna has been involved with KRSG as a provincial level gymnast since 2008. She has also attended one Canadian Gymnaestrada and one World Gymnaestrada held in Helsinki, Finland. Currently, she is competing in the national stream as a member of a rhythmic group of five. Brianna hopes to share her passion and love for rhythmic gymnastics with the next generation of young gymnasts! Caroline has been involved with the KRSG club for over ten years. She started her training in the recreational program and transitioned her way into the Rising Stars program, followed by the provincial stream. 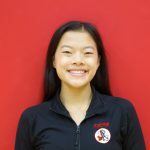 Caroline is currently in a national rhythmic group of 5 and she also coaches Saturday recreation program classes. 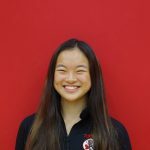 She spent one year working as a coach in training with the club and currently has her NCCP level 1 and NCCP level 2 certification. 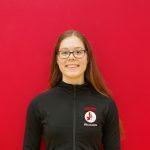 In addition to her coaching experience and involvement as a competitive gymnast, Caroline has participated in one Canadian Gymnaestrada held in Calgary and one World Gymnaestrada held in Helsinki, Finland, broadening her passion for the sport of rhythmic gymnastics. Michelle has her NCCP level 1 coaching certification, and she is working towards her level 2 certification. Michelle has been doing gymnastics since she was five years old. At the age of eight, she advanced to the provincial stream and she competed as an individual gymnast for seven years. 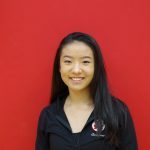 In 2013, Michelle moved to Ottawa from Toronto, and she joined Kanata Rhythmic Sportive Gymnastics Club (KRSGC). 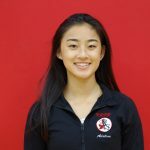 Her experience as a recreational, provincial and AGG gymnasts as well as, her passion for working with children has inspired her to begin coaching. 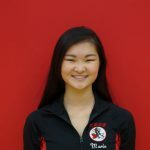 Michelle is currently in high school, and this year Michelle is part of a rhythmic group of five gymnasts competing with three hoops and two clubs. Along with her group, Michelle will be competing at national level competitions. She is very excited to pass on her passion and love of this beautiful sport to new aspiring gymnasts. 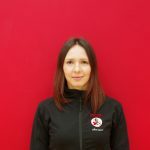 Kara is a NCCP level 2 certified coach and has also taken her NCCP level 3 theory. 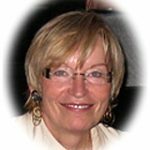 She has coached athletes of all ages and abilities for over a decade in both Ontario and Alberta. She is also a judge for the KRSG club. Kara was trained as an athlete and then as a coach by Dasa. She was a Provincial Champion and has attended both Canadian and World Gymnaestradas. Kara graduated from the University of Ottawa with a degree in Biochemistry and a degree in Chemical Engineering. She currently works as a Professional Engineer in the Aerospace Industry and enjoys volunteering, coaching and judging with the KRSG club whenever time permits. Olesya was born in Russia. Her love for rhythmic gymnastics started when she was 6 at Olympic gymnastics center. She competed at National level. In 1998 she began coaching little girls. Olesya graduated from Siberian State Sports University in 2003 with the degree in Physical Education and Coaching. During 18 years of work she has gained great experience in the field. She was part of the coaching team that produced Olympic champions and medalists. Olesya immigrated to Canada in 2007 with family and continued being passionate about rhythmic gymnastics. Coaches in training are all current or former KRSG gymnasts with experience in both individual and group rhythmic gymnastics competition with a wide variety of equipment, and aesthetic group gymnastics. With training from Gymnastics Ontario, as well as Head Coach Dasa Lelli in progress, these coaches are enthusiastic and ready to share their knowledge and love of the sport with the next generation of KRSG gymnasts. Erika is a CIT (coach in training) and has her NCCP level 1 theory and technical certification. She joined the KRSG in 2005 as part of the Recreational Program and later joined the Rising Stars. At the age of 6, she was invited to the provincial stream where she became a 3 time Provincial Champion as an individual, a member of a duo, as well as the group of 5. She has been a national level individual gymnast for 3 years and this year she is competing at the Senior level. Erika has also participated in one Canadian Gymnaestrada in Calgary, and a World Gymnaestrada in Helsinki, Finland. Britney is a CIT this year and is currently working towards becoming level 1 NCCP certified. She joined KRSG in 2011. Throughout her 9 years in the sport, Britney has been a provincial champion as an individual and has competed in a provincial AGG and RG group. This year she is competing in a National stream rhythmic group. Britney has also participated in 2 Canadian gymnaestradas, as well as a World gymnaestrada. She is still in high school and is incredibly excited to share her love of gymnastics with others! Sam joined the club in 2009 as part of the recreational program. She then joined the Blossoms AGG group and has competed with them for 7 years. Sam has also participated in 1 Canadian Gymnaestrada and will travel to Austria this year to perform with the World Gymnaestrada team. 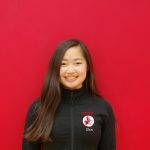 She is working towards her NCCP Level 1 certification and is excited to coach rhythmic and aesthetic group gymnastics to other young rhythmic gymnasts. Bernadette is a CIT this year and working towards completing her NCCP level 1 certification. She started rhythmic gymnastics with KRSG in the recreational program in 2010. When she was 8 years old, she joinded the AGG group the Kanata Blossoms where she is still competing. 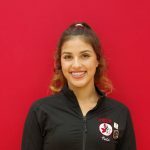 Bernadette has participated in Ontario Gymnaestrada and Canadian Gymnaestrada, and looking forward to taking part in the World Gymnaestrada in Austria next July. She is excited to share her love of rhythmic gymnastics with younger gymnasts. 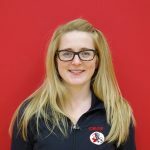 Emma is a CIT (coach in training) this year and is currently working towards completing her NCCP level 1 certification. Emma joined KRSG in 2012 and has been doing gymnastics for 7 years. She started with 2 years in the recreational program and then joined interclub individuals where she trained and competed for 4 years. During her second year of individual she was invited to join the AGG group Blossoms where she has been ever since. 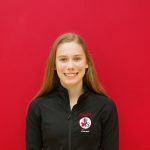 Emma has been to one Ontario and Canadian gymnaestrada and is currently training in preparation for the world gymnaestrada in Austria this summer. Emma is super excited to start coaching and share her love and passion for gymnastics with other gymnasts. Veda joined KRSG in 2009 where she began in the recreational stream. After completing all the badges, she did 1 year of interclub individuals and then joined the Blossoms. She's beginning her fourth year with the blossoms, currently competing at the provincial level. This year she is a CIT and can't wait to start working with the other gymnasts! Nathalie is a CIT (coach in training) this year working towards being a level 1 NCCP certified coach. She joined KRSG at the age of 8 as a part of the Recreational Program. 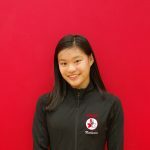 When Nathalie was 10, she started competing as an Interclub Individual, later on competing in a Provincial Junior Level AGG Group. 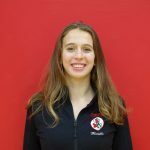 Nathalie also participated in Canadian Gymnaestrada in Vancouver and will be participating in the World Gymnaestrada in Austria. She is very excited to pass down her knowledge in this sport to other athletes.